Midwater Assessment & Conservation Engineering (MACE) program scientists completed an acoustic-trawl survey of walleye pollock in the Gulf of Alaska (GOA) between 12 June and 12 August 2011 aboard the NOAA ship Oscar Dyson. The main purpose of the survey was to estimate the abundance of semi-pelagic walleye pollock and other dominant species within the GOA. Similar MACE surveys were conducted during summers 2003 and 2005. The 2011 survey was conducted eastward from the Islands of Four Mountains to the eastern side of Kodiak Island along the GOA shelf. The survey trackline included cross-shelf transects oriented mainly north-south and spaced 20 nmi apart, as well as more closely spaced transects in the vicinity of the Shumagin Islands, Shelikof Strait, and within numerous smaller bays and inlets (Fig. 1). The survey, initially intended to cover the GOA eastward to Yakutat, was cut short by 16 days due to ship-related mechanical and personnel issues. Unlike the Bering Sea survey, where midwater trawl catches are essentially limited to walleye pollock, the GOA survey includes more bathymetrically complex areas which exhibit higher biodiversity. The combination of the shortened survey with fewer opportunities to trawl and the more diverse ecosystem led to some uncertainty in the classification of backscattering layers on the outer GOA shelf. Acoustic backscatter data were collected along transects at five individual echosounder frequencies (18, 38, 70, 120, and 200 kHz) during daylight hours. Walleye pollock abundance estimates were based on backscatter detected at 38 kHz. Opportunistic midwater trawls were conducted to classify the backscatter attributed to walleye pollock and other organisms. A bottom trawl was used to identify near-bottom backscatter, and daytime Methot trawls were conducted to identify suspected euphausiid backscatter. Figure 2. 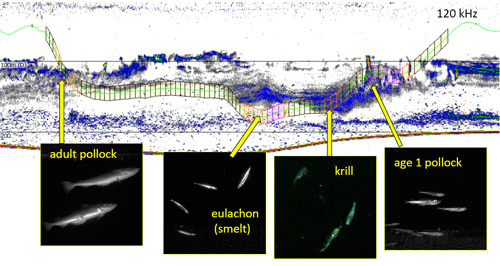 An example of Cam-Trawl images used to aid in classifying acoustic backcsatter during the summer 2011 Gulf of Alaska acoustic survey analysis. The line representing the path taken by the trawl is overlaid on the acoustic echogram, with shades of gray indicating density of targets in Cam-Trawl images. These data enable classification of multiple types of acoustic backscatter within a single trawl haul. A newly developed stereo camera system (Cam-Trawl) was mounted in the back of the midwater trawl and used during most hauls. Cam-Trawl has the potential to provide information on the species and size composition of organisms throughout the entire tow path and thus provides much finer spatial scale information than possible using traditional trawl methods (Fig. 2). This information can be used to improve species classification of the acoustic data in many situations. The summer 2011 survey was the first time that the system was used in a production mode. It performed flawlessly and will be used in the future with an open codend as a high-resolution, non-extractive sampler on some hauls. Ancillary activities included a multibeam bottom-mapping study, conducted predominantly at night, to determine the feasibility of classifying the seafloor as trawlable or untrawlable. A drop-camera was deployed for ground-truthing purposes. Physical oceanographic data were collected in support of the trawlability study. Underway water samples were also collected to make salinity, chlorophyll, and oxygen measurements. A multiple opening-closing codend device, which allowed several discrete samples to be taken during a single trawl haul, was used to investigate vertical distribution patterns of semi-pelagic species until it was damaged on 8 July. Walleye pollock were found throughout the surveyed area. Approximately 45% of the pollock biomass was found on the outer GOA shelf, 35% in Shelikof Strait, 8% in Barnabas and Chiniak Troughs and the remainder in the smaller bays. Walleye pollock fork length (FL) composition differed by geographic area. Fish 35-65 cm FL with very few smaller juveniles comprised the majority on the GOA shelf, and in the Shumagin Islands, Sanak, Chiniak, Pavlov and Mitrofania Bays. Nearly all the age-1 pollock (10-18 cm) encountered during this survey were found in Shelikof Strait with a few fish in Morzhovoi Bay. The most numerous size classes were 10-18 cm (age-1) followed by the 40-55 cm FL range.